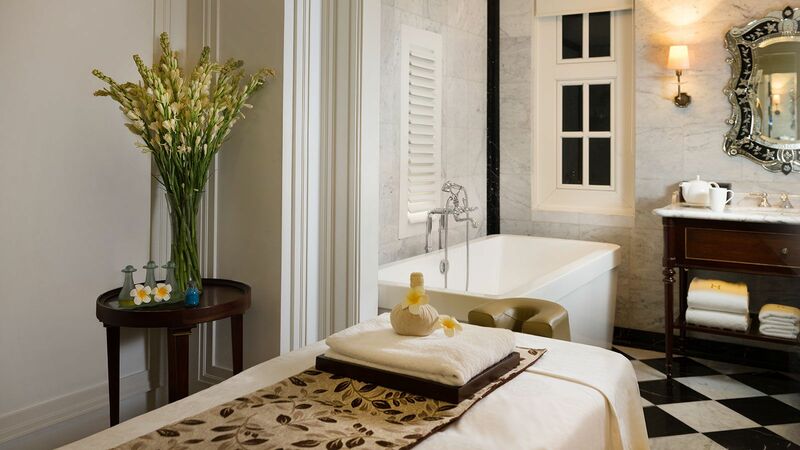 Balancing the human senses through holistic harmony is elevated to the highest level at the Spa at The Hermitage Jakarta featuring with Cantik Ayu Spa, where you will enter place that concerns with a world of comfort. From the simplest treatment to an extended massage therapies to create memorable experiences for our guests. Explore our range of treatments on our Spa Menu, from signature treatment, body massages, facials treatment, spa packages, to hand and foot treatments. Applies pressure to the deeper muscles and bones by massaging in the same direction as the ﬂow of the blood circulation. Also known as sports massage, Swedish massage relieves sore muscles, increases ﬂexibility and promotes general health. A massage that uses all parts of the hand. A Javanese massage works on the muscles and nerves to relieve tension, improves the blood circulation and is good for back pain. Of all the Asian massages, this is the most robust, but greatly beneﬁcial in the long run. Combined with traditional massage techniques. Tension melts away as warm oil is used over the entire body, radiating deep into tight muscles and bringing your body into a state of deep relaxation. Aromatherapy Massage uses a combination of techinques like Chinese and Japanese. It rejuvenates tired muscles and connective tissue for relaxation. The massage treatment is enhanced with varieties of house-blend essential oils that helps to relax. Using hazel extract, aloe vera, sea weed or chamomile to improve hydration. Your skin will be left calm, nourished and radianted. Originated from the kingdoms of Java. This treatment begins with a turmeric, sandalwood, herbs and spice body scrubs which leaves skin clean, fresh, smooth and soft. Treatment continues with acupressure massage using the thumb to release tension. It increases the circulation of your blood and heighten your energy to aid healing. Treament ends with a body whitening mask and a warm fresh ﬂower bath, to make the skin look even more radiant. Refresh and renew your skin with an antioxidant-rich tonic treatment to reduce inflammation, green tea essentials provide the body with powerful detoxifying effects. The green tea extract and the light massage is producing a real sense of relaxation while hydrating and nourishing the body. This treatment combines chocolate and soothing massage techniques. The cocoa bean has a fiber coating, which breaks down harmful free radicals (the wrinkle-causing molecules), as well the grease of cocoa butter helps to hydrates and soften the skin. Using gentle thumb and finger pressure-point massage to improve blood circulation to relax tired feet, and exfoliate. Treatment begins with antiseptic foot bath followed by a relaxing Aromatherapy Massage. One’s body is then wrapped with cloth to keep the boreh paste in contact to your skin, leaving a warm and tingly sensation after the application. The treatment ends with a warm fresh ﬂower bath accompanied by a cup of hot ginger tea. The treatment rehydrates and cleanses your body from inside out. Advance reservations are recommended for all treatments.